Dublin’s Jervis Shopping Centre is to get its first major shake-up in 20 years with plans by the UK’s Arcadia Group to replace its five fashion shops with a new flagship Topshop-Topman store. The rearrangement has been facilitated by the group’s decision to avail of a 20-year break option in its lease to launch the new store next summer to replace its current lineup of Wallace, Miss Selfridge, Burton, Topman and Topshop. The company has agreed a rent of €1.3m for the new 1,858 sq.m (20,000 sq.ft) store on the ground and upper ground levels. It has been paying a rent of €2m for the five shops which occupy a larger floor area extending to 2,787 sq.m (30,000 sq.ft). Letting agents Savills will shortly begin marketing two 464 sq.m (5,000 sq.ft) shops on the ground and upper level which are expected to bring in a combined rent of about €1m. The new Arcadia letting at a rent of €386 a sq.ft is the highest for a flagship store on Henry Street although it is less than the terms agreed for the considerably smaller Ann Summers outlet, which was let last year at a Zone A rent of €450 a sq.ft. Darragh Cronin of Savills, who handled the letting, said Topshop and Topman were seen as one of the pillar mid-market fashion brands with a dedicated worldwide following. The letting of the new flagship store marked a major reinvestment in the brand in Ireland by the Arcadia Group. The Jervis Centre has been trading for 20 years since it was developed by Paddy McKillen and Pádraig Drain. It has more than 60 retail outlets and parking for 750 cars. Other leading fashion traders in the centre include Stradivarius, Bershka, Forever 21 and New Look. One of the anchor tenants, Next, trades out of 577 sq.m (6,220 sq.ft), at ground and basement level at the front of the store, and a further 1,323 sq.m (14,250 sq.ft) at the back of the centre, previously occupied by Lifestyle. 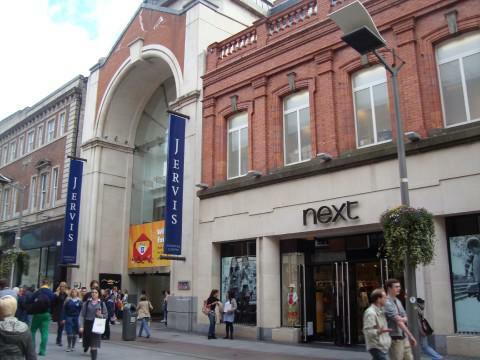 Next has been paying rents of €625,000 for each of the stores and , with its leases allowing for both upwards and downwards rent reviews, it has sought a reduction in both rents. The matter has gone to arbitration and the recommended rent is due to be announced shortly.